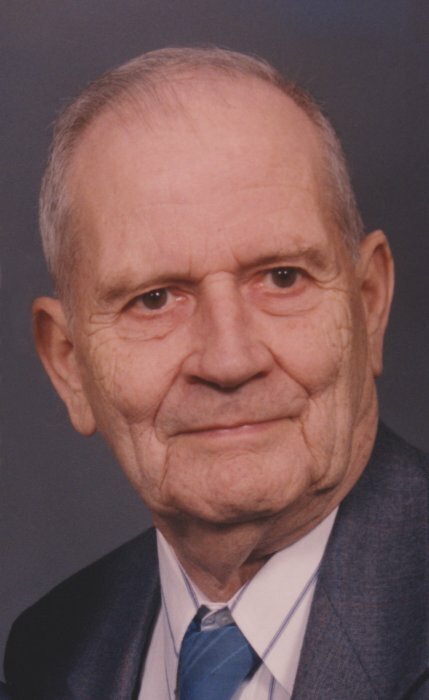 Carl was born on May 28, 1921, at his family’s home in Colfax Township, Grundy County, Iowa, to his parents Renko Sr. & Henrietta (Mammen) Schmidt. He grew up near Holland, where he attended country school. Carl and his family attended the Colfax Center Presbyterian Church in rural Holland where he was baptized as a young boy. He became a member of the American Lutheran Church in Grundy Center, in 1954. On September 18, 1947, Carl was united in marriage to Leola Flater in Independence, IA. The couple welcomed two daughters into their family. Carl farmed on the family farm until 1957. He then began working at Gene’s Locker in Holland, then Ritchie Manufacturing in Conrad, Mid-Equipment in Grundy Center, and lastly Richileu Foods, from which he retired. Carl was a hardworking man, who provided a good living for his family. In addition to his farming career and other occupations, he worked as a carpenter, a skill he learned as a young boy that he took with him his entire life. Carl helped build and remodel houses and during his retirement, he enjoyed many woodworking projects. He also enjoyed vegetable gardening and enjoying the fruits of his labor with his family, friends and neighbors. He was a wonderful family man and a very special dad. His daughters admired his hard work and dedication but what they will miss the most about him is how caring he was towards them. No matter what his daughters were going through, he was always there to lend a helping hand and be there to listen. They will miss him dearly but know he is now at peace, and with those that went before him. He is survived by his 2 daughters, Carolyn Schmidt and Becky Schmidt; many nieces and nephews. Carl is preceded in death by his parents; wife Leola; siblings Anna (Hank) Werkman, Renko Jr. (Gertie) Schmidt, Lucy (Hank) Abels, Margaret (Herbert) VanDeest, Martha Schmidt, Esther (Chris) Freese, Irene Schmidt and infant sister Helena.